Chocolate. Such a nice word, isn’t it? Dark Chocolate – even better. When it’s good it’s oh so good but when it’s bad it can turn people off forever as it did me when I was younger. It wasn’t until my early twenties when I lived in New Zealand and went to a chocolate factory I really started to appreciate chocolate. And if I thought it was good in New Zealand, you can imagine how I felt when I finally went to a chocolate shoppe in Belgium than France! My only bit of chocolate snobbery is that it must be high-quality, junk free chocolate. This is due mostly because of taste preference although since I am allergic to gluten, I can’t have most chocolate that is flavoured or mixed with things. And what are my favourites? I thought you’d never ask. Chocolove: This is hands down my favourite because it’s the easiest to find in the US, the ginger flavour is amazing, the pure 77% dark chocolate is the best after dinner and the price point is wonderful. I love these so much I often give them out as gifts and confess having turned certain girlfriends into Chocolove Addicts. Leonidas: One night in Brugge I found this. I took a sample box (about 17 pieces) back to my room. I thought I’d have a piece or two before going out. I couldn’t stop and spent the night watching a movie and going through the box. It. Was. Heaven. I’ve found that they’re not as good when buying them in the US and have had problems when purchased in London. But the store in Brugge and Cork, Ireland were both fantastic. And they have gluten-free truffles. My favourite was the white chocolate with strawberry cream. Butler’s Chocolates: Discovered in Ireland, this Irish Chocolateire makes fantastic hot chocolate and even better truffles. Most are gluten free but double check the web site. 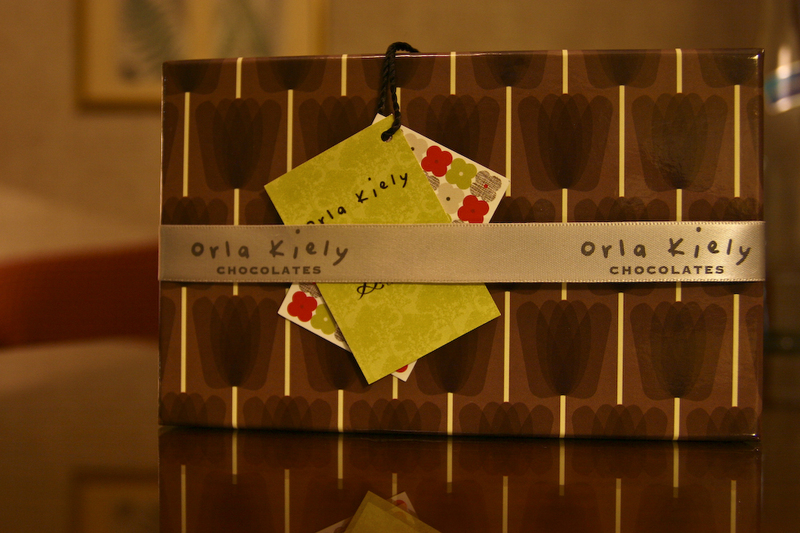 What I love is that they teamed with Irish Designer Orla Kiely to produce a special box which I had to buy. The chocolates were devoured very quickly, however. Dagoba: What I love about this company is all their chocolates are gluten free (and it says so on the wrapper) and 100% organic. They have some pretty strange (to me) flavours so I mostly just stick with the lavender which is oh so lovely with Earl Grey Tea. I was always a milk chocolate fan until I moved to France. Now I love the dark chocolate. It’s hard to beat anything bought in France. Fran’s Chocolates in Seattle, WA. Chocolate covered figs, salted caramels and oolong chocolates- and their hot chocolate is so perfect, it is hygge in a cup.